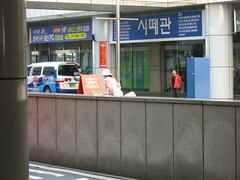 There's a curious dance of sorts which takes place on a daily basis outside some of Busan's larger stores. It's the dance of directing traffic to the store and its parking spaces, and the dancing girls who perform it stand, bow and wave their arms in what seems like a closely choreographed display of corporate presentation and endlessly repeating passacaglia. But while all the dancing girls appear to have a common goal, not all of the dances are the same, with, as far as I have observed, variations on hand movements being a particular favourite. Today I passed a girl who shook her aloft white-gloved hands rapidly as cars left her store, perhaps as a thank you gesture, albeit a rather strange though mesmerising one. Perhaps this is her trademark and not something dreamt up in the minds of some surreal Korean middle-management meeting, and it would be nice to think there is some room for individuality in a role which strikes me as being one of the more tedious I've seen here. This dancing girl from a few days ago isn't a big follower of the very rapid hand movement school of thinking, but is very big on bowing to the cars racing towards her, which in Korea, seems altogether too trusting when you're stuck out in the middle of the road. Along with greeting you, they also give you a parking coupon for when you leave. They are also usually miced up to a PA speaker.